While solving one of those online programming puzzles1 I needed to compute all points in a collection of rectangles. 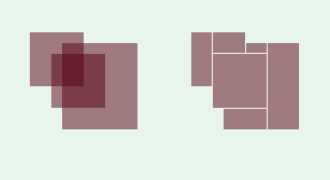 Note that these rectangles can overlap! One quick way to solve this is to maintain a Set (as opposed to a List) of points belonging to each rectangle. This would have been nice, since I anyway needed to iterate over these set of points. However, for large rectangles, the set quickly becomes huge and unmanageable (number of points is proportional to square of rectangle width). The rectangles on the left are the input. Note how they overlap. The rectangles on the right are the output. The Scala code for this is attached to this page Region.scala. Feel free to use it as you like. The result is not unique. Multiple correct solutions are possible and the chosen one depends on the order in which rectangles are added. If you ever happen to use this piece of code, please drop me a note/comment.